In the early morning of April 16, 2014, over 270 schoolgirls were abducted from their school in Chibok, Nigeria by the Islamic militant group Boko Haram, whose name translates to “Western education is a sin” in the local language. The abduction was not the first time the group kidnapped girls and women, particularly for pursuing their educations. The scale of the abduction, however, as well as the passionate response of the girls’ parents and communities, captured worldwide media attention. At a rally following the abduction, the girls’ communities put pressure on the government to do more to find them, holding signs that read “Bring Back Our Girls.” The slogan was quickly picked up by international organizations, including Girl Rising and Girl Up, as a Twitter hashtag, #BringBackOurGirls, aiming to draw media attention to the story and put pressure on the United States government to help as well. Momentum quickly grew as over one-million tweets featured the hashtag and dozens of think pieces were written debating the efficacy of hashtag activism. I think the real issue, however, is the use of the word “our” and the implications of images of sad-eyed white women replacing the original image of Nigerian mothers demanding that the government bring back their girls. Although the campaign is incredibly effective at bringing attention to the abduction and to on-going issues around girls’ education globally, I worry about the longevity of this concern (i.e. was it just trendy? ), as well as the neo-colonial implications of the media coverage. In short, while I think attention to these problems is a great thing, I also wonder if a lot of this attention didn’t serve to make privileged Westerners feel good about themselves rather than to actually address the underlying problems that allow such gendered violence to happen continually. I don’t want to criticize anyone specifically, so much as open a space to reconsider the implications of human rights campaigns such as #BringBackOurGirls and how unchecked privilege can undermine good intentions. Let’s begin with some feminist theory. In Feminism Without Borders, Chandra Talpade Mohanty argues for a feminist solidarity as a political and ethical goal, rather than “vague assumptions of sisterhood or images of complete identification with the other” (3). She also likens transnational feminist communities to imagined communities, “‘imagined’ not because it is not ‘real’ but because it suggests potential alliances and collaborations across divisive boundaries, and ‘community’ because in spite of internal hierarchies within Third World contexts, it nevertheless suggests a significant, deep commitment to what Benedict Anderson, in referring to the nation, calls ‘horizontal comradeship.’” (46) In other words, rather than relying on reductionist or essentialist ideas of what constitutes a woman, solidarity in transnational feminism is derived from the members of the community imagining commonality amongst themselves and investing in the good of the community over and against actual political and economic inequalities that may exist between members of the community. This construction of the “average Third World woman” plays into the “politics of pity” and “asymmetrical reciprocity” in human rights campaigns critiqued by Wendy Hesford. In Spectacular Rhetorics, Hesford explains the use of suffering and pity in human rights campaigns that hope that by identifying with another’s vulnerability one will “be moved to act on his or her behalf” (46). Hesford argues, however, that victim-based politics are limited by the way they also serve to obscure the structural inequalities, economic injustices, and other imbalances that create the suffering in the first place. In other words, victim-based campaigns may be emotionally effective, but they reify hegemonic ideas about the West, power, and the economic conditions behind many human rights crises. Furthermore, the politics of pity also rely on the need for a Western subject to recognize the suffering of the other in order to act. Hesford argues that recognition, witnessing, and spectatorship in human rights spectacles such as unveiling of Afghan women or the September 11 terrorist attacks are a rhetorical phenomenon and that accounting for them as such would “require us to frame the emotions that human rights images solicit as part of a visual economy of affect” (57). In other words, this spectatorship reinforces the idea that Westerners “standing with” victims of human rights violations constitutes a sort of gift in which we, the powerful, bequeath our attention and resources to the less powerful. This dynamic not only makes us, the powerful, feel generous and benevolent, it reinforces our power through the notion that our attention and generosity can effect lasting change. To a degree, it might, but that would require the powerful to give up some power and to have longer attention spans. While the politics of pity “conflates the language of humanitarianism and human rights by positioning the other as the recipient of the gift of rights distributed by the powerful” (Hesford 47), victim-based politics can also be damaging to human rights campaigns as it “invites interventions and protectionist remedies that can obscure structural inequalities and economic injustices, and that therefore ultimately undermine the promotion of human rights” (47). In other words, standing in solidarity or promoting intervention, even when well-intentioned, can sometimes deflect attention away from the policies and systems of power that created the problem in the first place. Feel-good solidarity is not as effective as actually addressing the political, gendered, and economic inequalities at work. Back to Bring Back Our Girls. I think that the adoption of the hashtag #BringBackOurGirls falls somewhere between the type of coalition that Mohanty envisions and the victim-based rhetoric that Hesford critiques. On one hand, the show of solidarity had real effects in driving the Nigerian government, as well as the U.S. and U.K. to commit more resources to finding the girls. Further, a Safe Schools Initiative was launched in over 500 schools in northern Nigeria with the government pledging $10 million to support it. The initiative was started with millions of dollars donated by a coalition of Nigerian business leaders working with UN Special Envoy, Gordon Brown, the Global Business Coalition for Education, and A World At School. There’s an actual coalition at work deploying actual resources. On the other hand, the use of the hashtag largely appropriates the voices of the Nigerian women who started the campaign, subverting their rhetorical agency not only by co-opting their words, but also by ignoring the colonial history implicit in white Westerners declaring Nigerian schoolgirls “our girls.” While the idea of white Americans using a possessive to refer to young African women across the globe doesn’t sit well with me, I’d be a little more generous if the show of solidarity kept the focus on the efforts of Nigerian people to get the schoolgirls back. What I find more incriminating, however, is that the visual rhetoric quickly shifted from photos of the protest at which “Bring Back Our Girls” originated, and related imagery, to pictures of celebrities and “ordinary people” in the U.S. holding signs with the hashtag #bringbackourgirls on them. From Malala Yousafzai and Michelle Obama to Amy Poelher and other celebrities, these pictures quickly appeared on social media platforms in the U.S., U.K., and elsewhere. Especially in the latter examples, the “narcissism of pity” (a la Lilie Chouliaraki) seems to be at work. The focus is shifted from the Nigerian school girls themselves to representations of Western celebrities showing their solidarity. 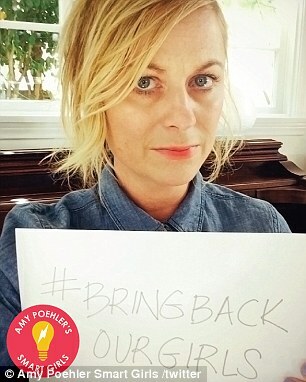 There are already pitfalls to the imagery used in the social media representation of Bring Back Our Girls. The images of schoolgirls looking directly to camera are reminiscent of images of Afghan girls in human rights rhetoric, particularly the very famous National Geographic photo and AIUSA’s “Imagine” campaign, which Hesford discusses in her work. As Hesford points out, the photos do not tell the girls’ stories so much as they tell the story of what the West sees in the photos. They put the emphasis on the viewer of the photo who creates meaning around the subject, rather than giving rhetorical agency to the girls to speak or to create meaning about their lives. This appropriation sort of directly shows how human rights spectacles create a narrative of pity around certain subjects as it directly contradicts both the story of the photos’ subjects and the intent of the artist who took the photographs in the first place. How can we show solidarity in situations such as this abduction without falling back on a politics of pity, patting ourselves on the back for caring, or subverting the rhetorical agency of other people? I think that it is important in these moments to maintain a pretty steady focus on local efforts and local politics. Plenty was happening in Nigeria and continues to help there. Rather than exploring the problems with Boko Haram, the efforts of the girls’ families, or learning about the girls themselves, however, media attention shifted to the easier and more self-congratulatory story of hashtag activism. Why do stories like this disappear from the news cycle so quickly, yet I get seventy CNN updates a day about sports and celebrities? When girls like Malala Yousafzai and the kidnapped Nigerian girls become human rights icons do their stories change? Are limits placed on what they can or will say, what we can or will hear? How can language and political barriers be crossed so that girls can have more rhetorical agency? Are people willing to listen? In the future, how can hashtag activism be parleyed into effective change? I think #bringbackourgirls, both locally and on international social media was quite effective at getting attention and pressuring political leaders to act. In the U.S. when missing children are reported in the news, a disproportionate number of them are white and male (Communication Research Reports). How do responses to human rights crises uncover hypocrisy or blindness about racial and gendered issues domestically? We do not have it all figured out in the U.S., that’s for sure. I’m not saying I’m better than or superior to anyone. My blog isn’t just about children’s books, it’s about a lot of things, among them my dissertation work which works on these issues and will hopefully enable me to use my degree to do work in the field.